May Day might not be as big of a celebration in 21st century Russia as it was in the Soviet Union, but it is still a day for demonstrations and marches. This May 1, along with photographs of political signs urging to Free Navalny! [ru] and accounts of arrests at political rallies [ru], RuNet was flooded with reports of a different kind. The photographs stand out from a sea of red (Communist) or blue (United Russia) flags — an odd slogan here, a carnival mask there. These are participants in “Monstration” (the word comes from “demonstration” with the “de-” removed, rather than “monster”), a quirky celebration of absurdity brought to you courtesy of Siberia. Монстрация — это пародия на традиционную демонстрацию с абсурдными требованиями и плакатами, где каждый участник заявляет то, о чём хочет. A Monstration is a parody of a traditional demonstration, with absurd demands and slogans, where every participant says what he wants. Although it has been adopted by other cities, Monstration still remains a largely Siberian, and specifically Novosibirsk, endeavor. This year it took place in Omsk, Tyumen, Khabarovsk, and Novosibirsk (all Siberian cities), as well as Krasnoyarsk, Yekaterinburg, Yaroslavl, and five cities in the Ukraine and Moldova. Attendance is telling — this year Novosibirsk drew a crowd of over two thousand [ru] (as it has for the last four years), while Krasnoyarsk had around 40 participants [ru], and Omsk does not look to have broken [ru] the several dozen barrier. Even Moscow's rally in 2011 only had 200 in attendance. 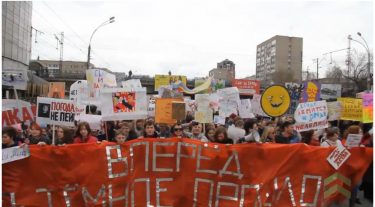 Curiously, Yekaterinburg's first attempt at a Monstration this year was a major success — the citizen journalism portal Ridus reports [ru] that there were over 1000 marchers. 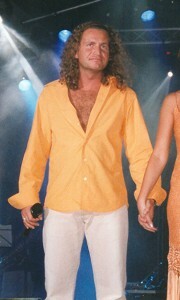 Leonid Agutin performing in 2003. “Russia without Agutin” is a slogan many people could probably get behind. Public domain. Wikimedia Commons. Национальная идея начинает постепенно вырисовываться: всей страной влезть в желтую Ладу-Калину, и овладеть решительно Сашей Грей. Как Америкой, ненавидимой и вожделенной. Желательно – на фоне ковра. Виктор Цой предупреждает — автобусы убивают! “Forward into the dark past!” YouTube screenshot, May 2, 2013. Although it is technically not a “flashmob,” the Monstration phenomenon probably would not exist without the internet. The events in the various cities were organized through the monstration.ru [ru] blog, which posted the time and place of the meetups, as well as city-specific [ru] pages [ru] on the social network VKontakte [ru]. The pages also noted whether the event was coordinated with the respective city governments. The importance of the Internet also goes for the slogans and posters. There are several online repositories of past Monstration slogans — the biggest one [ru] lists them by year and city, presumably for those people too lazy to come up with their own. And sure enough, the “Russia without Agutin” slogan already appeared once in Novosibirsk, 2011. Не понравилось, что коммунисты вышли с коммунистическими плакатами. Извините, что это, блядь, такое? […] Зачем вы вечно лезете даже туда, где вам нет места? I didn't like the fact that the communists came with communist posters. Sorry, but what the f*ck is that? […] Why are you constantly trying to infiltrate even where there is no place for you?